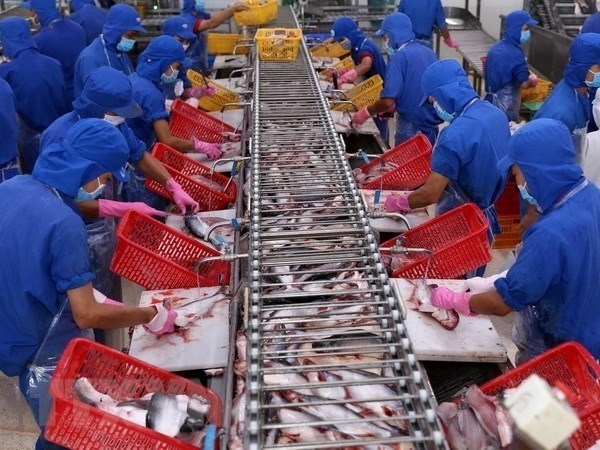 Reports delivered at a conference in the Mekong Delta province of An Giang last week said Tra fish exports to the US and the European Union (EU) have recovered recently. Tra fish export turnover to the US in the first seven months of 2018 reached US$255.3 million, 15.6 percent higher than in the same period last year. Meanwhile, Vietnam’s exports of tra fish to the EU in the period hit US$139.1 million, a yearly increase of 16.5 percent. Notably, tra fish exports to the Netherlands and Italy soared by 43 percent and 83.1 percent, with respective values of US$38.1 million and US$14 million. The US-China trade war is a good opportunity for Vietnamese tra fish exporters to gain market share in the US, experts said. In January-July, Vietnam’s tra fish export turnover hit US$1.198 billion, up 19.3 percent year-on-year. China remained the biggest importer of Vietnamese tra fish, followed by the US and the EU. Total export turnover of tra fish to China reached US$289.8 million in the last seven months, an annual rise of 40.6 percent, making up 24.2 percent of total export turnover for the product. According to General Secretary of the Vietnam Association of Seafood Exporters and Producers (VASEP) Truong Dinh Hoe, Vietnam’s exporters are facing many difficulties in selling their products in China because the country has erected technical barriers to tra fish products imported from Vietnam. To promote the export of seafood and tra fish in particular to China, Vietnamese exporting firms need to ensure the quality of their products, VASEP said.